Otis Skinner, the actor starring in “The Duel” at the Mason Opera House,” is under arrest because of a curious regulation in which passengers of a speeding car are charged with breaking the law. 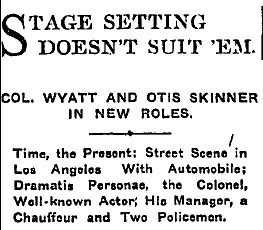 Col. Henry Wyatt of the Wyatt Lyceum Circuit was giving Skinner and his manager a scenic tour of Los Angeles when Wyatt’s chauffeur was stopped by motorcycle Officers Humphreys and Green on 7th Street east of Figueroa as they returned to the theater. Wyatt, who was a deputy sheriff, complained to police authorities that Humphreys and Green refused to identify themselves as officers and wondered whether the whole affair was a joke as he didn’t believe he was speeding. Skinner, in fact, said he thought the new automobile was moving rather slowly. The defense attorney for William J. McKinley on charges of attempted murder heaped doubt on the question of whether his elderly uncle William Reid had even been shot, so during a recess in the trial, doctors took an X-ray and removed the bullet, which had flattened against Reid’s skull. “The results of the operation seem to settle that question beyond cavil,” The Times said.